New York Times Bestseller! 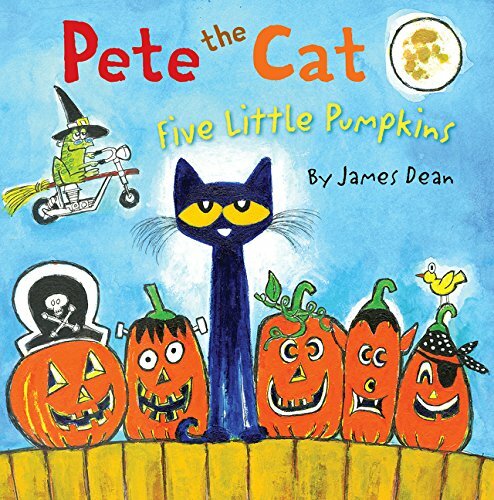 Bestselling author and artist James Dean brings us a groovy rendition of the classic favorite children’s song “Five Little Pumpkins,” sung by cool cat Pete and perfect for Halloween. Pete the Cat: Five Little Pumpkins is in a sturdy paper-over-board format and filled with vibrant, engaging illustrations for even the youngest of Pete fans. Young Halloween fans will enjoy chanting along with Pete: Five little pumpkins Sitting on a gate. The first one said, "Oh my, it’s getting late."